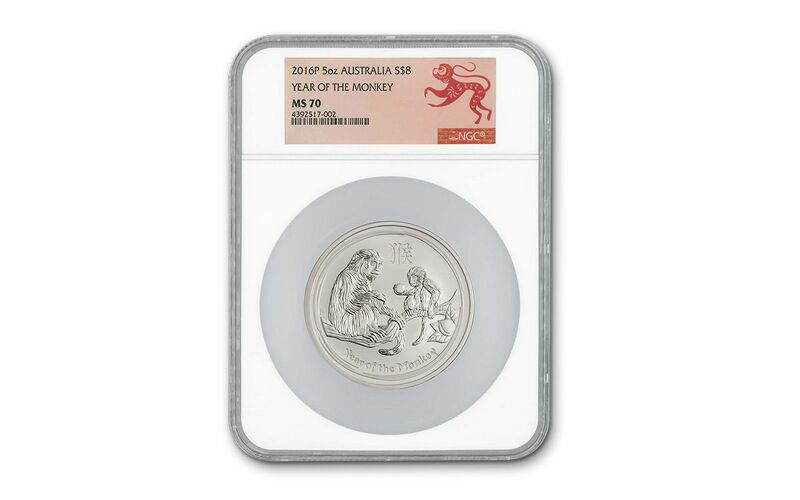 Your Last Chance for Graded 2016 Australian Silver Year of the Monkey Coins! As 2016 wrapped up, we took a quick look through our vaults to make room for 2017's latest and greatest releases. 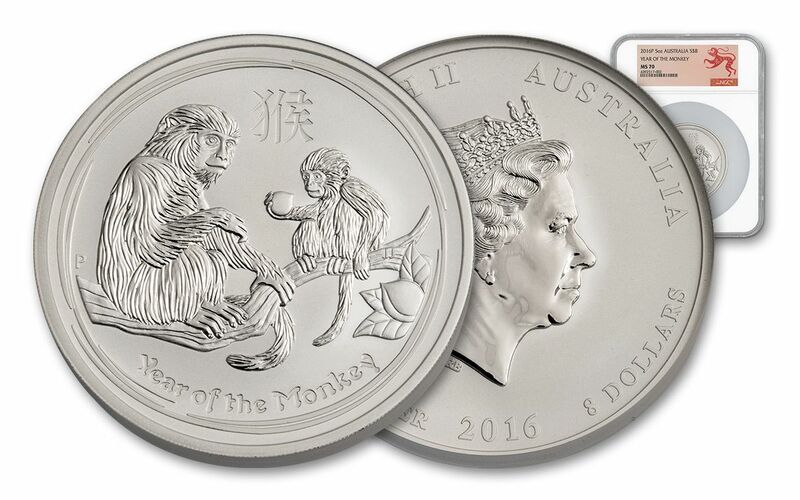 Fortunately, we found this loveable group of 2016 5-oz Australia Year of the Monkey coins! Even better, when we checked up on the status of these coins, they turned out to be rarer than we initially thought! These gorgeous silver coins, each struck by The Perth Mint in five ounces of 99.9% pure silver, celebrate the Year of the Monkey in 2016. According to the Chinese lunar calendar, 2016 joins the years 1908, 1920, 1932, 1944, 1956, 1968, 1980, 1992, 2004, and 2016 under this particular sign. In Chinese culture, those born in the Year of the Monkey are regarded as intelligent, quick-witted, optimistic, ambitious and adventurous. What great compliments! The reverse of each coin features an adult monkey and baby monkey sitting in a peach tree. The baby is holding a peach, which symbolizes longevity and immortality. The Chinese character for "Monkey" and the inscription "Year of the Monkey" also appear along with The Perth Mint's "P" mintmark. Flip the coin over, and you'll see Ian Rank-Broadley's profile of Her Majesty, Queen Elizabeth II along with the year. 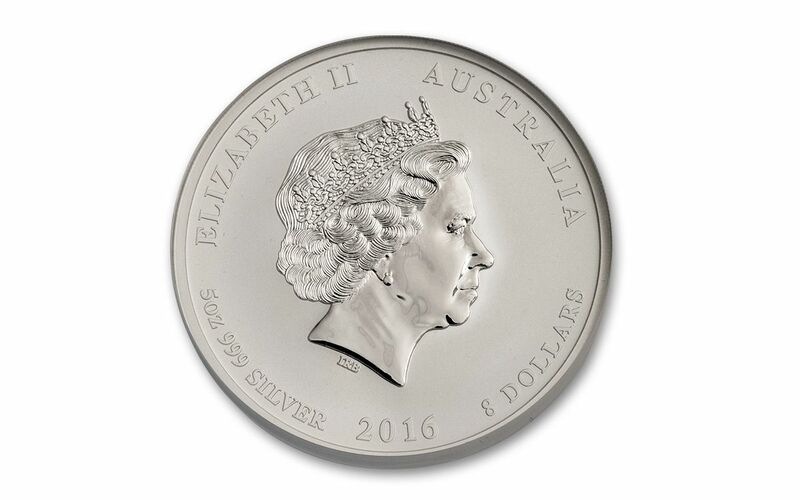 And, since this coin is Australian legal tender, you'll also see the denomination of eight dollars. Now for the really interesting part -- the official mintage for these 2016 5-oz Year of the Monkey coins was set by the Perth Mint at exactly 11,678. And, as of late June 2016, only 34 have been submitted to Numismatic Guaranty Corporation (NGC) for grading. That's right -- 34! Which means this perfectly-graded Mint State-70 (MS70) coin is among only a few dozen of its kind in the world! Add to that the fact that lunar coins like these are being acquired by private collections around the world at a rapid rate, especially in China, and you can see why we expect these coins to have an extremely short residence in our vault. 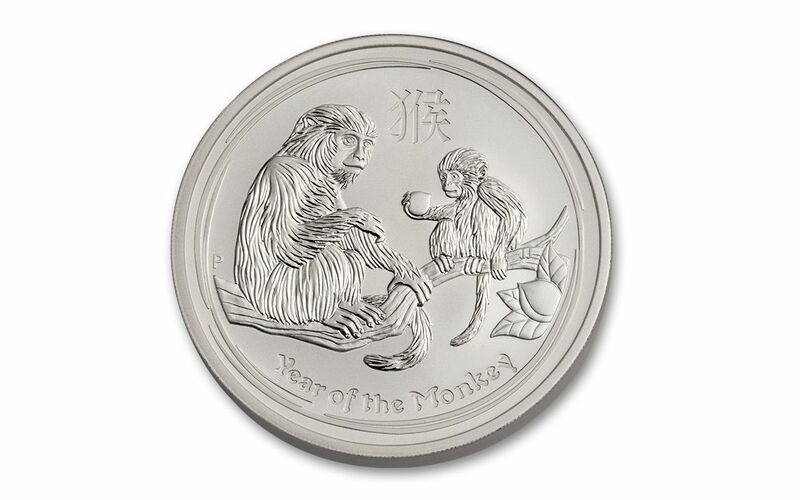 Don't miss out -- capture this Silver Year of the Monkey coin for your collection today!